Eight Early Stage Researchers of the AdMoRe ITN, coordinated by the Laboratori de Càlcul Numèric at UPC, presented the results of their ongoing research at ECCM-ECFD 2018 in occasion of the 25th anniversary of ECCOMAS. The Laboratori de Càlcul Numèric at Universitat Politècnica de Catalunya is the coordinator of the Marie Sklodowska-Curie Action, Innovative Training Network, AdMoRe. AdMoRe stands for "Empowered decision-making in simulation-based engineering: Advanced Model Reduction for real-time, inverse and optimization in industrial problem" and is a network including three academic institutions across Europe (UPC, École Centrale de Nantes and Swansea University) and four industrial partners (Volkswagen AG, Siemens Healthineers, Airbus, ESI Group). 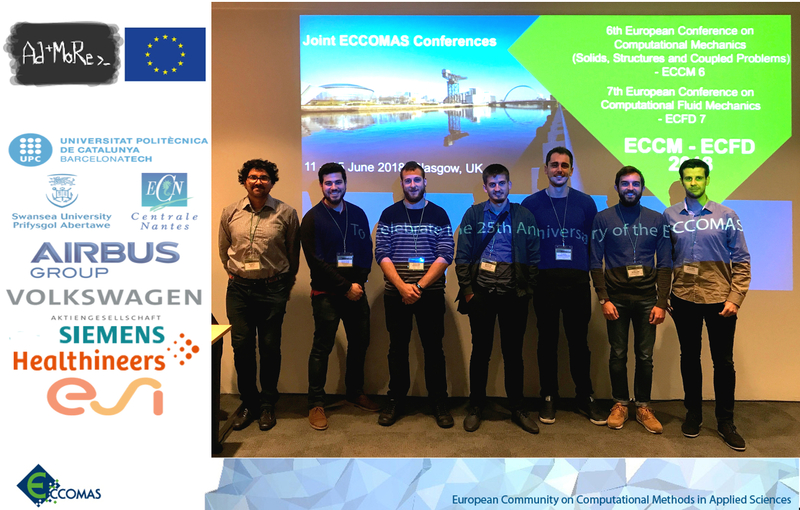 During the recent ECCM-ECFD congress on computational mechanics and computational fluid dynamics, the eight Early Stage Researchers trained by AdMoRe successfully presented their ongoing research on simulation-based engineering, discussing topics from high-fidelity simulations to model order reduction applied to different problems of industrial interests.